Why a Rama Raksha Yantra? Your actions reflect your thoughts. When your thoughts are pure, you perform good deeds and are bestowed with happiness and peace. Lord Rama is the personification of pure thoughts, noble virtues and utter triumph. By praying to him, your thoughts can be purified, your spiritual interests upgraded, and you can become a winner. When you become a spiritually active person, you will yearn for peace and the blessings of God more than any other material pleasure on this earth plane, and you will walk a pathway to enlightenment. Your clarity of thought plays a vital role in determining your success. The positive energy of Rama can remove your conflicting thoughts and bring you mental peace so you can be focused and clear with the attitude of a winner. It can stabilize your mind and give you an unblocked flow of positive, goal-oriented thoughts. 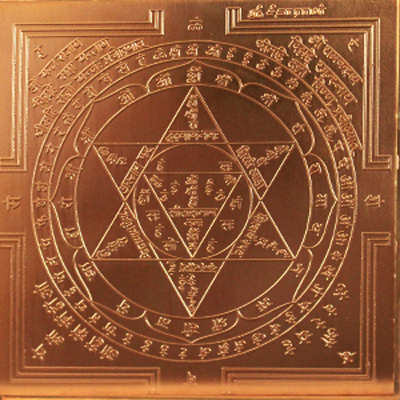 Your dedicated prayers to this Yantra can stir your soul and bless you with happiness, peace and success. Be assured of tranquility and divinity at your side forever when you possess this Yantra!